Text You can target 3 "True Draco" and/or "True King" cards in your GY; shuffle them into the Deck, then draw 1 card. 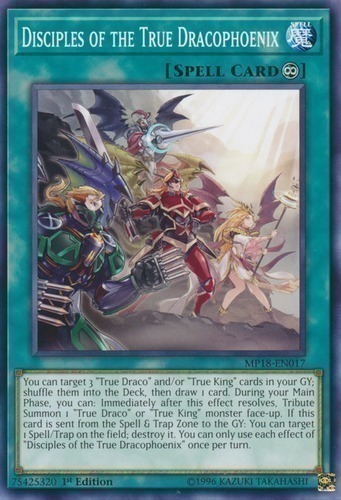 During your Main Phase, you can: Immediately after this effect resolves, Tribute Summon 1 "True Draco" or "True King" monster face-up. If this card is sent from the Spell & Trap Zone to the GY: You can target 1 Spell/Trap on the field; destroy it. You can only use each effect of "Disciples of the True Dracophoenix" once per turn.